PRESS RELEASE: Designed in celebration of the 40th anniversary of the Minimoog, the Minimoog Voyager XL is a sonic powerhouse that pays homage to important milestones in the Moog synthesizer legacy. It starts with the heart of a Minimoog. Fat oscillators and warm Moog filters give it that unmistakable Moog sound and the build quality and user interface design immediately let you know that you are playing a high-quality musical instrument. 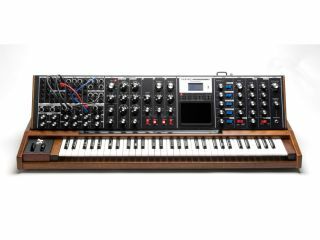 The Minimoog Voyager XL features extensive front-panel patchability that harkens back to the original groundbreaking Moog modular synthesizers. The addition of a 4-channel CV mixer, 2-channel attenuator, lag processor and MIDI-synced LFO make this a sound design and analog control dream machine. From the current Voyager lineage, the XL inherits a 100% analog signal path with stable oscillators, patch storage, touch surface, pot mapping and extensive MIDI control functionality. To all this, add a ribbon controller and 61 note keyboard and you have a monster analog monosynth built on a 40 year legacy of sonic exploration. 61-Note Velocity Sensitive Keyboard with after-pressure. Identical to the Voyager 44-note keyboard. A 500mm Ribbon Controller is located on the middle wooden rail of the Voyager XL. It's centerpoint is lined up with "middle-C" of the 61-note Keyboard. Outputs are sampled and available as CV-OUT (-5V to +5V) and GATE-OUT (0V to +5V). Active Attenuators are identical to the VX-352 attenuators with the following difference: CHANNEL 1 is normalled to LFO 2 output. So, if nothing is connected to the Channel 1 input jack, the output of Channel 1 will be the attenuated version of the LFO 2 output. CHANNEL 2 is normalled to RIBBON output. So, if nothing is connected to the Channel 2 input jack, the output of Channel 2 will be the attenuated version of the RIBBON controller. EXPRESSION PEDALS can be connected to the Attenuator inputs (i.e. they are ring-powered inputs). AMOUNT controls gain of -1 (CCW) to 1 (CW). Thus, the attenuators can create an inverted version of the waveform. OFFSET control allows you to add a DC voltage of -5V to +5V to the input signal. The Attenuator output will be clipped to approximately +/-10V. RISE and FALL time constants are adjustable from 1 ms to 1 second (middle is 100 ms). A MIDI-syncable with a default frequency range is 0.02Hz (50 seconds) to 20Hz (0.05 seconds). This range was made to augment the current Voyager LFO which does not go slow-enough for some very slow modulations.